Welcome to Sai Bhajans Virtual Classroom. If you are wondering what this means, you will come to know about it in just a few moments. 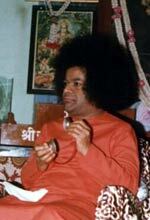 Swami says that singing the name of the Lord is the most effective spiritual sadhana in this modern age. No wonder Bhajans are a regular feature (in fact twice a day) at Prasanthi Nilayam. 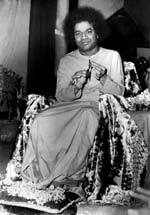 Swami always stresses the importance of Bhava, Raaga, and Tala i.e., the feeling, the melody and the rhythm of the Bhajans. In addition, one also has to pronounce the words correctly, which, if not done, could make the bhajan mean altogether something different! So here we present to you a virtual classroom, if you may say so, of Sai Bhajans sung at Prasanthi Nilayam. The Sanskrit version and the English translation are given below. Notice that there are three buttons on the right hand side of this page. Click the first one titled 'pronunciation' and you will listen to the correct pronunciation of the words of the bhajan. Next click the button titled ' tune'. You will hear a voice alone, singing the tune of the bhajan for you. Click the third button entitled 'full version' and you will listen to a full version of the bhajan with all the accompaniments as it was sung before Bhagawan! We hope to present to you one bhajan every issue. Of course, the first one has to be a Ganesha bhajan….so lets get started !! !